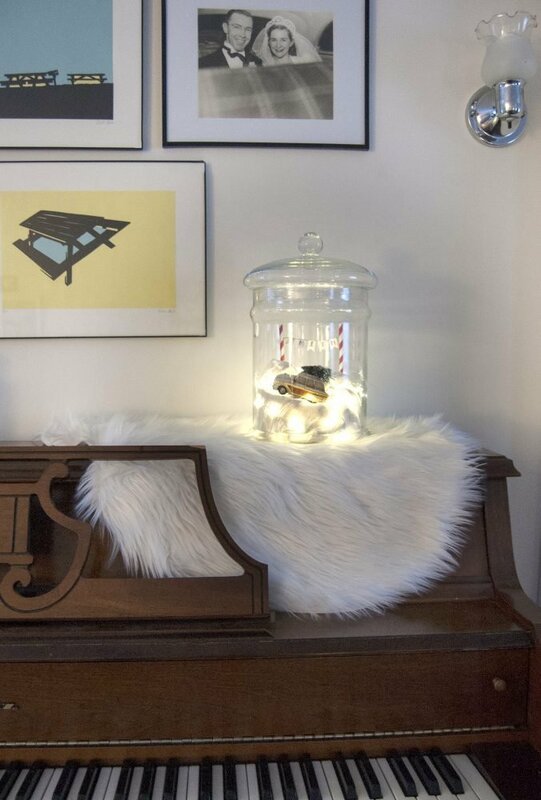 If you’ve ever wanted to climb into a snow globe, this project is for you. I love the magical feeling I get when I shake one and watch the snowflakes fall, so while thinking about holiday gifts this year I decided to create a larger scale winter wonderland terrarium to give away. The great thing about this is that you can customize it for the person (or family) you’ll be giving it to. Add whatever you think they’d like best for decoration and top it off with a banner that spells out their family name. You can create it with one particular holiday in mind or swap out the Christmas tree for a snowman or sled so it’s relevant for the whole season. Read on to find out how I made mine (spoiler alert: it started with a trip to Goodwill)! 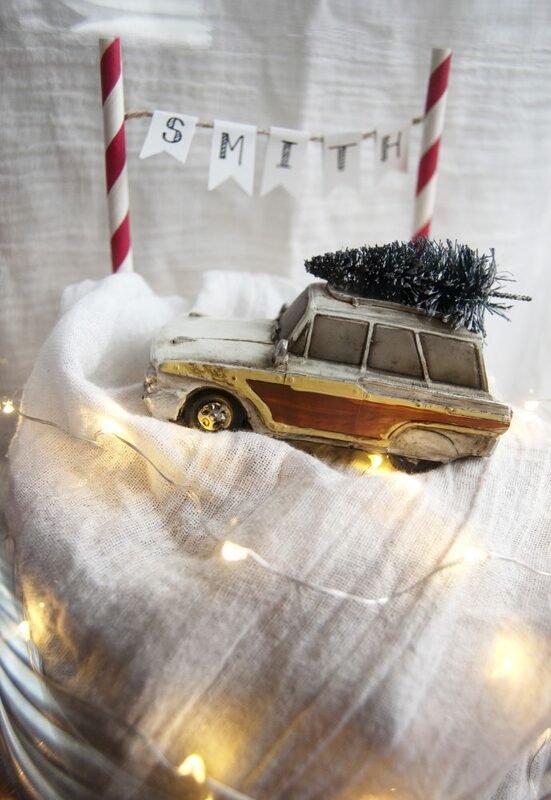 You could also add birch branches or pinecones foraged from outside! Snip a slice about an inch long into both of your straws. 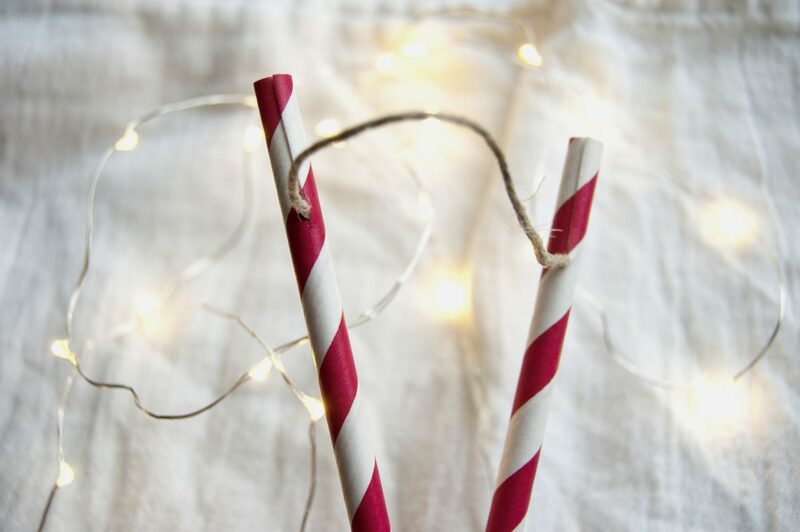 Measure a piece of twine out that is a little bit longer than what you need to spell out the name of the person (or family) you’re making the gift for. Knot it on both ends. Slip the knot into each straw and slide the twine down to the bottom of the cut sections. 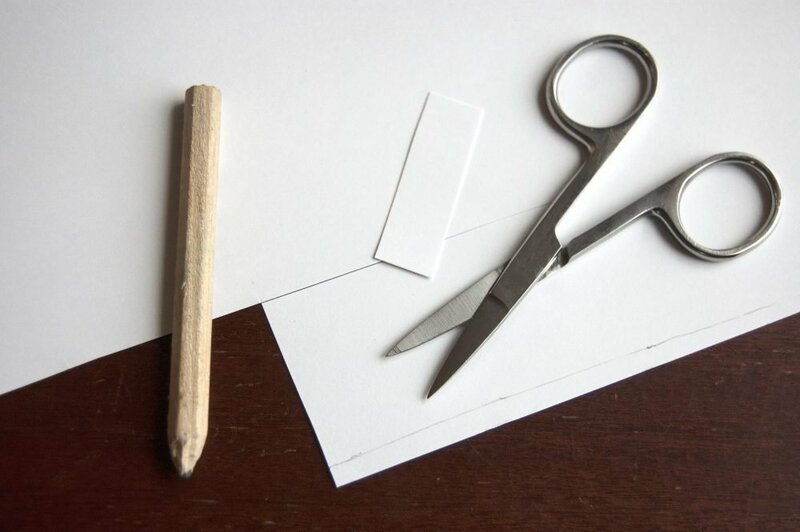 Cut the paper for your banner. You’ll need one piece for each letter of the name. My paper rectangles were each about 1 ½ inches x ½ inch. Before I cut them all out I drew a long line in pencil near the bottom of the area in which I was cutting. This creates a guide so that each notch I cut into the pennants comes out about even. 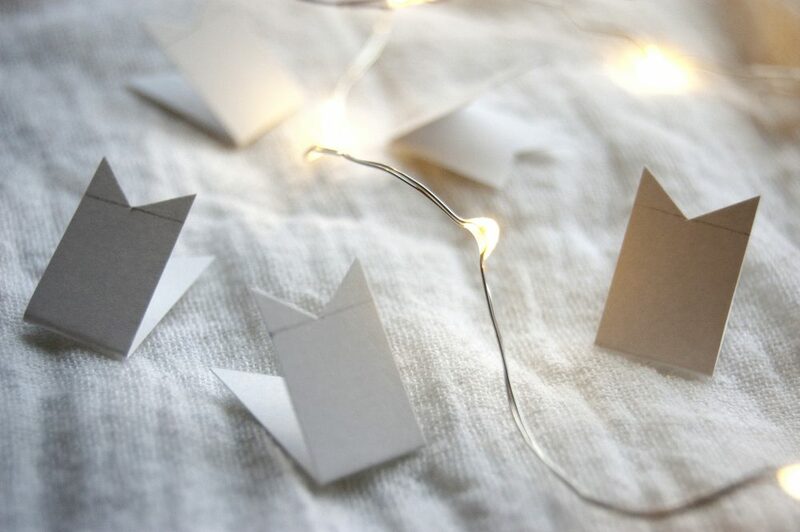 Fold each rectangle in half then cut a V shape through both layers using the pencil line as a guide for the V’s height. When you’re done with that, erase the pencil or just write your letters on the opposite side. Fold each letter around the twine so you can get the spacing correct. 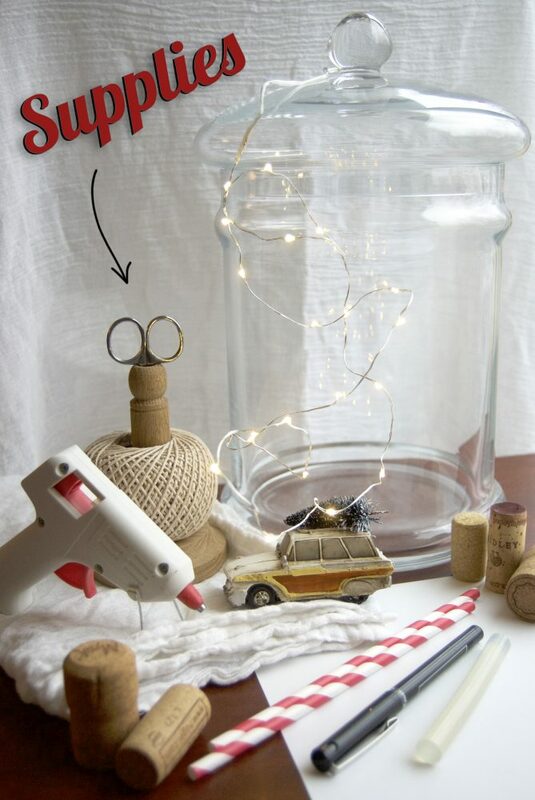 When it looks right to you, add a dab of hot glue inside the paper right where it rests on the twine. Quickly pinch it closed. Dab a dot of glue to the bottom of one straw and stick it to the bottom inside the jar. You’ll want to place it right up against the wall so you have more space to decorate in front of it. Do the same to glue the second straw in place. Now add the snow! You could use traditional fake snow, but I liked the idea of fabric much better for a lot of reasons. The texture is much more fun, you can easily drape it over twinkle lights, and with corks supporting it, the snow will be firmer and easier to rest heavy ornaments on top of. To get my snow arranged just right, I flipped the lid of my jar over (you could also use a bowl) and draped the cloth over it. I took one string of LED lights, turned it on, and spread it out on top of the fabric making sure that the on/off switch was hanging out. Then I began to pile in the corks wrapping the rest of the lights around the outside of them. Fold the fabric on top of the cork into a bundle, but keep the light switch accessible outside of the bundle. Turn the whole thing over and carefully nestle it into your jar placing the light switch in the back right under the banner so you can easily find it. Turn on your second light string and place the control switch with the first one. 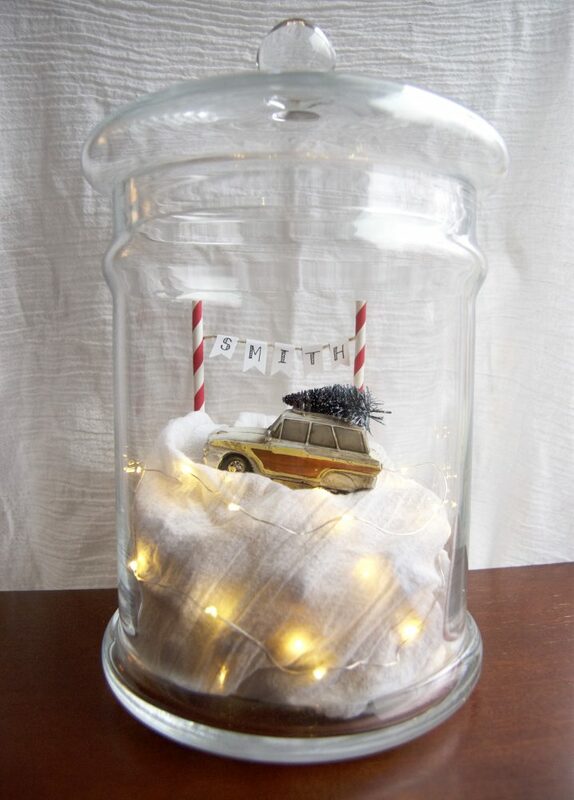 Reach down into the jar to wrap the rest of the string of lights around your snowy hill. Shift the corks into place as necessary to get a look you like. When everything is set, decide where you’ll add your ornaments. When the placement looks good, dab a little hot glue where you need to and stick everything in place! Another great thing about this faux terrarium is that it can’t die! Giving a gift that the giftee has to care for can be tricky. Those of us with black thumbs hate killing plants, but we hate killing plants that were thoughtfully picked out for us as a gift even more! This little winter wonderland has faux snow and a pretend evergreen so even I couldn’t kill it! If you’re eager for more greenery, add in some evergreen sprigs from your own Christmas tree or place a boxwood wreath around the base. I can just imagine the terrarium set up as a holiday dinner centerpiece! It’s the season of giving so I’m really excited that this project allows me to give twice over: First, it’s a personalized gift for the Smith family, but since I purchased some of my supplies at Goodwill, it’s also a way for me to give back to my community. 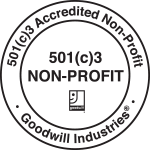 People who have participated in Goodwill organizations’ career services (made possible by dollars spent in Goodwill stores) have gone on to work with competitive employers, including the Internal Revenue Service, General Electric, General Motors, SC Johnson, Whirlpool, and the U.S. Army, Air Force, Navy and Marines. I love knowing that I’ve had a hand in that. Happiest holidays to you and yours!